Our new Rescue Room, also known as the Pepsi Parrot Pavillion, opened in March 2012! After many of our friends supported us by voting online in July 2011, we won a $25,000 grant from Pepsi, which paid for about a third of our construction costs. This new room, which meaures 16 by 53 feet, gives us almost 850 square feet of space devoted entirely to housing our rescued birds while they wait to be adopted. The Rescue Room has plenty of windows and great lighting, washable walls, a refrigerator/freezer for keeping fruits and vegetables fresh, a sink for cleaning their dishes, and a shower area with floor drain for cleaning large cages. The birds get showers there too! Almost everyone who visits the veterinary hospital takes a stroll thru the room to see the birds, and they often fall in love with a new feathered friend. Thanks to all this new space, the number of birds we were able to help in 2012 climbed to 212, up from 150 in 2011! 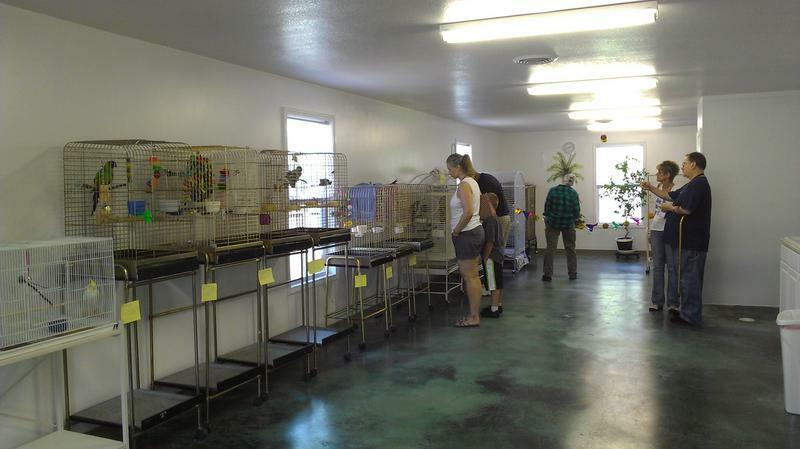 We are proud to have a facility where potential adopters can come and see up to 75 adoptable birds at one time. If you haven't been here yet, call us to schedule a time to come by and see all the beautiful birds! If you watch closely, you will see her in the first 3 seconds of the video walking into the property to check on critically ill birds before the rest of the team went in to load the birds for transport. The birds were moved to a safe facility, and were later adopted out to rescue groups all over the country. A local animal control agency called us to evaluate a case where over 80 birds were in a roach infested property. Some birds were in cages that were much too small, some were kept in almost complete darkness, some had food and water dishes coated in slime from lack of cleaning. There were cockroaches crawling out from under the cage papers, up the walls, on the furniture, and just everywhere you looked! The owner agreed to sign over 11 of the birds, some of which were obviously sick, to our rescue. The remaining birds were given to friends of the owner so the property could be cleared out and treated for the bug infestation. During the hottest part of the summer, Kansas City Animal Control confiscated 62 chickens from an illegal cockfighting operation. The Kansas City Pet Project, the official shelter for the city, was used to handling a few chickens, but they had never dealt with so many birds, or with over a dozen fighting roosters at the same time. When we found out they had so many birds and didn't know how to deal with them, we called in a group of volunteers and tackled the many issues involved in housing multiple birds in temperatures over 100 degrees. For weeks we were out there every day, setting up and cleaning cages, spraying the birds with cool water, buying them special water dishes and trays for bathing, and making sure each bird had the right food and the medical care they needed. 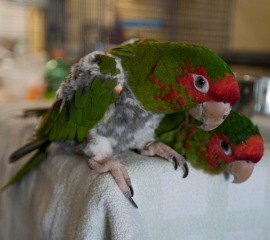 The birds were adopted a few at a time, and eventually they all found homes except for a couple that had severe medical issues from the chronic neglect they had suffered. Now the KC Pet Project staff knows they can call upon us whenever they are faced with any kind of bird issues, whether they are indoor or outdoor pets. Bogie the Nanday Conure came to us from the KC Pet Project as a result of another hoarding case. We had to board him at and his 9 bird friends at no charge for four months while legal procedings took place. They lived in legal limbo until the court finally decided that the birds would not be returned to their owner and could be signed over to our rescue and made available for adoption. A peahen is the female version of a peafowl, the male version is known as a peacock. This one was spotted in a Raytown neighborhood for over a week before she took up residence on the property of a man who actually did something to help her by calling us. Since she was resting comfortably in some brush, we thought we could slowly approach her and catch her with a big net. It turns out that she was quite an athlete, and she flew straight up like a helicopter and landed on the roof. She stood up there staring down at me, probably laughing, thinking she had escaped. Little did she know that I had more tricks up my sleeve. I set up a giant wire dog crate with bowls of chicken feed inside, and placed it near the bowl of cat food that the homeowner had seen the bird eating from. The next morning, the man spotted her inside the cage eating, and pulled the rope attached to the door. We never found her original owner, but found her a great new home as a companion for a peacock. A lot of our friends spent many hours and days helping us catch ducks this year. People often buy baby ducks for Easter, not realizing that they will grow up to be very messy and impossible to have wandering loose in the house! These two babies were found as strays in a neighborhood, and were brought to us so we could find them a new home. They are now part of a petting zoo, and are adored by hundreds of children wherever the zoo sets up a booth. We get to see them at the Renaissance Festival every year. We succesfully captured three adult ducks that had been abandoned on ponds around the area, but we are still trying to catch five others. People sometimes ask us why we don't just leave the ducks alone. Domestic breeds of ducks are not able to fly, and once their pond freezes over, they will not be able to find shelter or food or escape from predators. Even when fed bread and corn by humans, they will die from malnutrition and obesity since those foods do not make a balanced diet. Warning, some of the pictures of these patients may be too graphic for some viewers. Scroll down to the bottom of the page if you wish to see the photos of the surgeries or injuries. One of the abandoned ducks that we captured had an arrow sticking out of her chest for at least 3 weeks. After we lured her into a large wire dog crate with a trail of bread crumbs, we brought her back to the hospital and removed the arrow under anesthesia. It turned out to be a 7 inch long plastic crossbow arrow with a metal tip that was supposed to be for target practice. It had entered near her left hip and exited thru her right chest. The arrow miraculously missed her internal organs, and was actually touching her heart because it moved with each heart beat. This poor girl was not only abandoned in the wild, she was used for someone's sadistic amusement. She and her mate, who took considerably longer to catch, are now living happily and safely on a farm. This photo shows her a few days after her surgery while she was still on antibiotics, recovering from the nasty infection that the dirty arrow had left inside her. Otis the cockatiel had his upper beak bitten off by a cockatoo. He was hospitalized with us for weeks while we gave him pain medication, antibiotics, and tube feedings until he learned how to eat mushy soaked pellets on his own. His beak was too badly damaged to ever grow back, but like many other birds we have known, he should live a long normal life with just one beak. He loves his new home, and is not allowed near any big birds! Katie the cockatiel had a swollen nostril for 2 to 3 months before she was donated to our rescue. She had to go under anesthesia, where we discovered that the huge lump on her face was an accumulation of pus and mucus. It left her with a large hole in her head, which eventually shrank down to a nearly normal sized nostril. She could not breathe thru her other nostril, so we had to do a second surgery to cut open and clean out the cavity on that side. She may now have to be on antibiotic nose drops for the rest of her life, but fortunately she is the sweetest bird ever and doesn't mind it a bit. These last two cases were birds that came into our veterinary practice for treatement, but were not donated to our rescue. They were just great stories. A Blue and Gold Macaw (that just happened to be plucked mostly naked) had a growth on the elbow that had been getting larger and bloodier for months. Two other veterinarians had seen the bird and only dispensed medications rather than attempting surgery. By the time he came to see us, the tumor was larger than a golf ball. We were able to do surgery and remove the tumor, which was wrapped around muscles, tendons and bones. After bandaging for about a month, he is healed and feeling great! A 23 year old cockatiel had been noticed by his owner with swelling on his neck. Upon examination, he was emaciated, dehydrated, and had a growth that was almost wider than his body! After we spent a couple of days getting him on fluids and tube feeding him, he went into surgery. The tumor was wrapped around his trachea (windpipe), entangled in blood vessels and nerves, and was attached to his crop (where food is stored before it goes to the stomach). By some miracle this little old man survived his surgery, gained back all of his lost weight, and is enjoying his golden years! After surgery, the bird weighted 70 grams and the tumor weighed 20 grams! Since the oldest cockatiel we have seen was 25 years old, we hope to see this guy set a new record! Keep scrolling for graphic pictures.